The people at 1BOG (which stands for One Block Off the Grid) have made a much larger infographic which is more complete and breaks things down by the distance traveled. I don't usually like large infographics, but this one is worthwhile because it shows that for transportation, not one size fits all. For travel inside or near town, nothing beats a bike. (And it makes you feel happy. And it's good for you!). 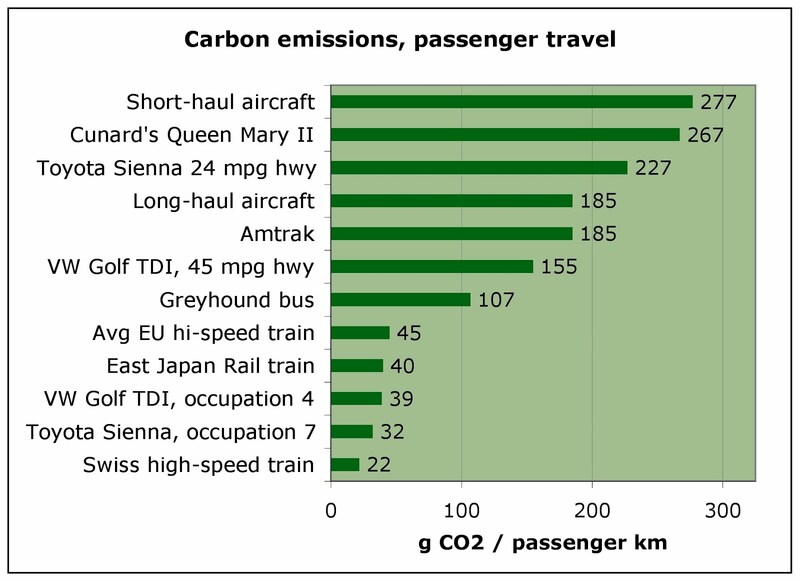 For regional travel, a bus is best right now, at least in the US where trains have a far larger carbon footprint than elsewhere. Certainly buses are cheaper. But where high-speed trains are installed and running frequently, they are obviously the preferred way to travel: they're always full. 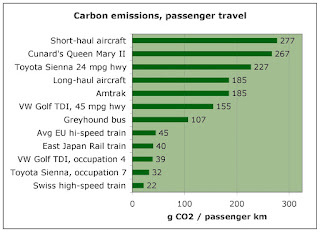 For long-distance trips, buses (and shared rides in efficient cars) are the very low-carbon way to go. But if you factor in the travel time, you can be forgiven for opting for flying. On this infographic, travel by car assumes that it's only the driver in the car, which is lonely and tiring. If you share the car, a chore becomes a social outing and, as my graphic above shows,the per-passenger emissions go way down. And I can't help mentioning: calling a car that does 32 mpg "efficient", as this infographic does for the benefit of American readers, is sort of embarrassing. In reality, 32 mpg is not very efficient. To give an example: my diesel Golf (38mpg) is on the gas-guzzler side of the average new European car, even the ones sold back in 2011. In a few years, my car will be a fossil-fuel relic, as the European emissions standards are progressively tightened. Thank you for this post. I'm surprised that in the US, a bus is more Eco-friendly than a train for regional trips. But that totally makes sense since "we" don't have great, high-speed, train systems yet. Hopefully that will change. Unfortunately, I've noticed a discouraging trend lately ... cities are eliminating bus routes due to budget cuts. This comes at a time when people are beginning to embrace mass transit. So it's like taking several steps back. Unfortunately the "bottom line" seems to trump the environment. Very sad! Ah but the long term bottom line is aligned with the environment! Especially if you factor in our health care budgets. Apparently Oklahoma City, whose residents have recently lost a million pounds (!) together, is now determined to keep off those pounds by having a less car-centric transportation policy. Yes!